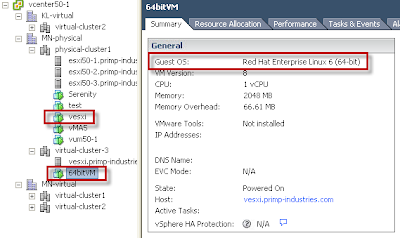 With the release of vSphere 5, one of the most sought out feature from VMware is the ability to run nested 64bit and Hyper-V guest virtual machines in a virtual ESXi instance. Previous to this, only 32bit virtual machines were supported as the VT-x/AMD-V Hardware Virtualization CPU instructions could not be virtualized and presented to the virtual ESX(i) guest. This feature is quite useful for home and lab setups in testing new features or studying for VMware certifications and running multiple vESX(i) instances. You will still be required to have a 64bit capable system and CPU and you will need to be running ESXi 5.0, this will not work for ESX(i) 4.x or older. The above diagram depicts the various levels of inception where pESXi is your physical ESXi 5.0 hosts. We then create a vESXi 5.0 host which will contain the necessary Hardware Virtualization CPU instructions to support a 64bit nested guest OS which I've created as another ESXi host called vvESXi. Note: You will not be able to run a 4th level nested 64bit VM (I have tried by further passing the HV instructions in the nested guest) and it will just boot up and spin your CPUs for hours. Once the configuration change has been made, the feature goes into effect right away. A reboot of the system is not necessary. To verify, you should now be able to power on a 64bit guest OS and see that the HV instructions bits are being passed into the guestOS which will then allow you to run a nested 64bit guestOS. 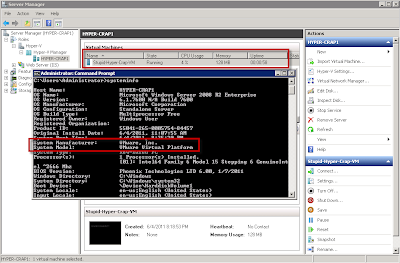 You can also verify by looking in the vmware.log file of the virtual machine and grep for the string "monitorControl.vhv" and if you see the following message, then Virtualized HV is not enabled. In the past to run a virtual ESX(i) instance, a few advanced .vmx configuration entries were needed as documented here. 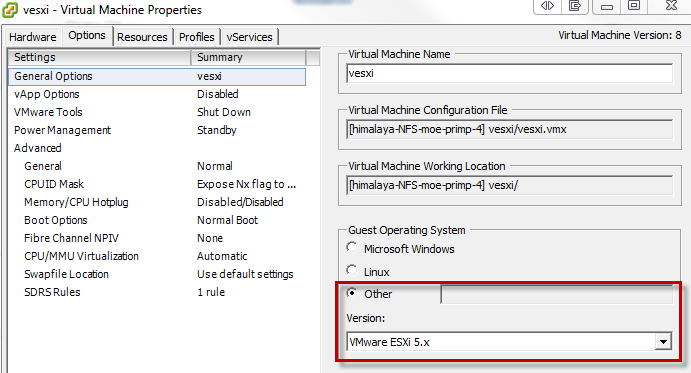 With ESXi 5.0, if you are using virtual hardware version 8, then you do not need to make any additional changes. 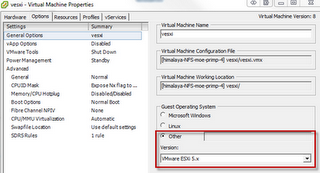 If you are using hardware version 4 or 7, then you will need to add a few changes to the VM's configuration file. 2. Once the VM has been created, edit the settings of the VM and change over to the "Options" and now have the ability to select a new guestOS type: VMware ESXi 5.x or VMware ESXi 4.x under the "Other" section. Note: I'm not sure why these two additional guestOS type is not available from the default creation menu, but are available after the initial VM shell is created. 2. Now you will need to add the following advanced .vmx parameter: monitor.virtual_exec = "hardware" which can be done through the vSphere Client and/or editing the .vmx parameter manually. 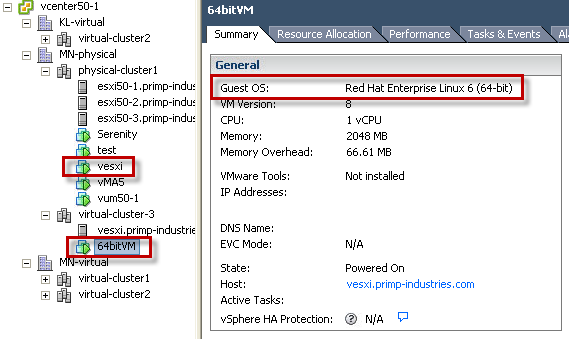 By using a VM that is hardware version 8, you can easily automate the creation of vESXi 5.0 instance by changing the guestOS string in the .vmx parameter to "vmkernel" and the above configurations other than "vhv" string needed for either an Intel or AMD system are automatically configured. 4. You are now ready to install Hyper-V in a virtual machine and you can also spin up nested 64bit guestOSes in this virtual Hyper-V instance. 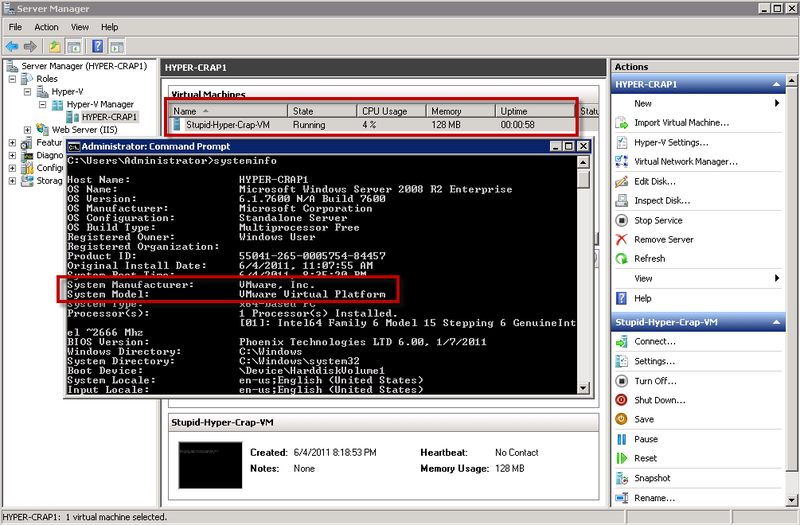 As you can see, now you can even run Hyper-Crap, err I mean Hyper-V as a virtualized guest under ESXi 5.0. I did not get a chance to try out Xen, but I'm sure with the ability to virtualize the Hardware Virtualization instructions, you should be able to run other types of hypervisors for testing purposes. This is a really awesome feature but note that this is not officially supported by VMware, use at your own risk.